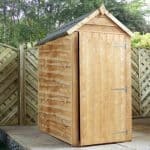 Giving you a very nice amount of storage space and also being something that will look just fantastic in your garden, the 10′ x 6′ Traditional Heavy Apex Shed really is a shed that is ideal in many ways. Being 10 x 6 there is plenty of room for you to store a number of items, both big and small. The shed has a very friendly look to it with those lovely windows which are on one side. Two of these are fixed and one actually opens to get in some fresh air. A very good sized door is located in a convenient space and it is large enough that getting something as large as a mower in here is going to be no trouble at all. While the default door looks amazing, you can even change this so it is stable style door. This shed is going to be in it for the long haul thanks to those gorgeous materials which have been chosen because of their strength and longevity. The tongue and groove shiplap cladding and the solid frame behind it makes this one of the most robust sheds from Treetops Traditional. Add to this flooring which is made from tongue and groove boarding and you really do have one very impressively designed shed. 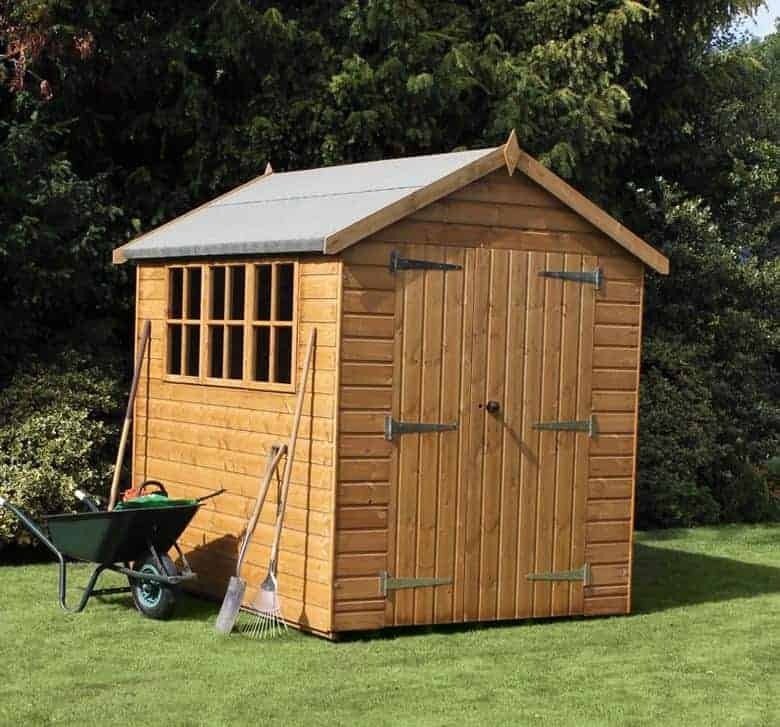 The 10′ x 6′ Traditional Heavy Apex Shed is a fantastic structure that has plenty of storage room and also a very impressive looking design. 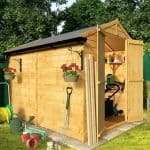 This makes this an ideal shed for those of you who do need that extra storage room, but also want something that is going to look great in your garden. This is a very deep shed at 10 feet and the width at 6 feet is not too bad either in our opinion. Inside the shed you really will have lots of floor space to make use of and actually because of the height you can stack things high or even add in some shelves. Along the ridge the height of the shed is 7 feet 8 inches and at the eaves the height is, 6 feet 1. The eaves height is something that really did impress us as it is a few inches more than we actually expected. As you can see from the pictures the walls of the shed have a very smooth and classy type of look to them. The reason for this amazing effect is that, Treetops Traditional have use 12 mm thick, tongue and groove shiplap cladding. This really is quite spectacular from a looks point of view, but because of the way that the boards have been put together, there really is no way for water to get inside. A solid frame is one of the first things we look for no matter if we are checking out a shed in person or looking over its specs and pictures that have been sent to us. This shed features what is becoming something of a Treetops Traditional trademark and that is their 44 mm x 27 mm round edged frame. This is a very robust frame that will keep the shed solid for at least a couple of decades. 12 mm tongue and groove boarding is what is going to be under your feet while you are inside the shed. Also these boards have some serious strength behind them and they are going to be able to handle a whole lot of weight so do not be worried if you have many heavy items you need to protect from the rain as this floor will be able to handle the weight. The wood used to make this shed is very high quality redwood and Treetops Traditional will make sure it has all been dip treated. This is a great extra that they throw in, but you will still need to get a tub of wood treatment, a paintbrush and cover the shed yourself, shortly after construction. Also a new coating once a year is required to really protect that lovely looking wood. 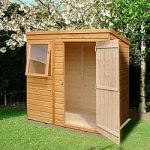 You will get the standard one year warranty with the 10′ x 6′ Traditional Heavy Apex Shed which will cover you in the rare occurrence that there is some kind of problem with the materials. In the pictures you can see a lovely double door this double door is a little over 4 feet wide and is available as an extra at a cost of, £53.99. The standard door the shed comes with though is impressive in its own right. It is a single door and at, 5 feet 9 inches high and 2 feet 6 inches wide it is a very good size. It is kept where it needs to be thanks to some very strong hinges and it even has a lock on there. If you want to change the look a little bit then you can actually request a stable style door. 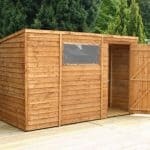 The 10′ x 6′ Traditional Heavy Apex Shed comes with three windows, two are fixed and one actually can be opened. For a cost of, £31.99 per window the other windows can be upgraded so that they can be opened also. These are very robust windows as they are made from some high quality, horticultural glass. The set of windows can be placed on either side of the shed during construction which is something we like. We mentioned while talking about the door how there is an actual lock included with this shed. So if you do plan on keeping things like bikes, a mower or even some rather pricy power tools. Then you will be able to sleep a bit easier at night knowing they are securely locked up. The windows are a very good size, large enough that it is easy to look into them and see what you have. The good news about this shed is that there are a few things you can do to give yourself a bit of privacy. First of all, Treetops Traditional have an option where you can have the shed fully boarded and have no windows at all. Also as you decide what side the windows go on, you can place them so they are not looking out onto the street and of course , you could use a set of curtains to hide what you have inside. There are a number of things that you can do with the door and the windows which we just mentioned before, but also you can change the colour of the shed thanks to there being wood treatment available in pretty much every shade these days. 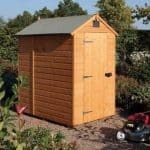 One of the main extras that is available with this shed is an installation service where for, £114.99 as well as delivering the shed they will install it also. Wooden floor bearers are the other extra that is available. These cost, what we consider to be a reasonable, £40.99 and they will help raise the shed a little off the ground and also give the floor a little bit more strength. As is the case whenever we look at a shed from Treetops Traditional, this one is high quality all throughout. While this will depend on how you look after it. With just a fresh coating, once a year, this shed will last you easily over two decades. We love the space this shed gives you and how it offers plenty of storage room, but at the same time it is not so large it will only be able to fit in really large gardens. As long as you have a friend to help you who is not too shy about making the odd cuppa. Then this shed should take you around 3-5 hours to install. Honestly this is pretty straight forward as long as you follow the instructions. While this is just under £800 and that clearly is a whole lot of money to spend. The way the shed looks and those excellent materials which have been used, do make this a shed where you are getting a lot for you money. Final Thoughts: As one of the more larger sheds from Treetops Traditional, the 10' x 6' Traditional Heavy Apex Shed offers you more than enough room to keep those epic tools you have rust free and the kids bikes from taking up permanent residence on the lawn. 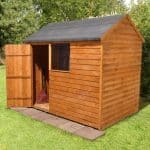 What we really like about this shed and one of the reasons that we are recommending it to you. Is that it is just so robust and well made that this really could be the only shed you need to buy as long as you take the proper care of it. Of course you can see from the pictures just how stylish this shed is and that along with those impressive materials makes this one of the best, large sized sheds from Treetops Traditional.